So I thought to myself "I'm on my computer all the time, I should make an app that puts my notification on my computer screen so I never miss this stuff." Turns out, somebody already made that app and it is as awesome as I had hoped. That app is Remote Notifier. Tip: Another great use case for Remote Notifier is not hearing your phone when using headphones at work. Now you will need the desktop portion - you can get the Mac OS, Windows, or Linux versions of the Notifier from HERE. As with any desktop application, you're going to need to install it. On my windows computer, a little icon showed up in my system tray immediately after the install. Cool. This is, obviously, where you adjust all the settings. 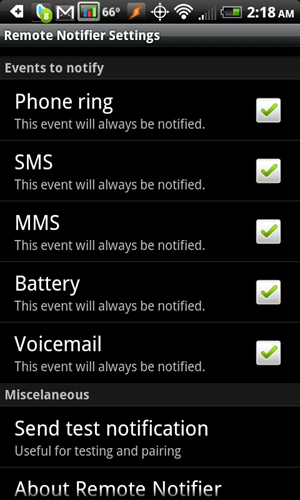 The Remote Notifier's settings are automatically configured for use over WiFi. If that is your intended usage (this is how I use it), you can turn on WiFi and start receiving notifications immediately. You can also set up notifications to be sent over Bluetooth but, alas, my computer lacks that ability so I have no insight into the set up. There is also an option for use over your mobile network connection but, no matter what I did, it simply would not work for me. I may not have been trying hard enough, so your mileage may vary. That means you have everything set up right. You can now go about your business listening to your headphones, leaving your phone on silent or in the other room, or whatever else leads you to miss out on what your phone is doing, safe in the knowledge that your computer is now going to tell you what is happening. Remote Notifier is a cool little app that runs on your phone and desktop. 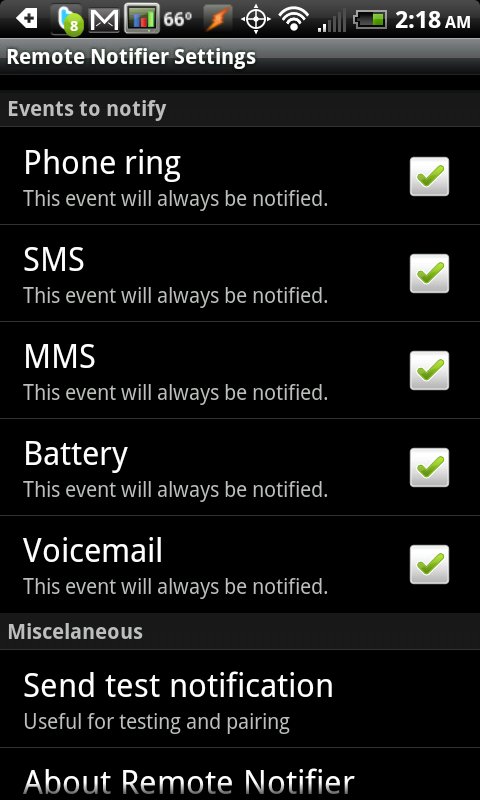 It shows you alerts when you get phone calls, text messages, and get low on battery. It is easy to set up (for the wifi function, at least) and does its job well. Overall, i wish i could have gotten the mobile network function to work, but it wasn't really a big deal. With a little tweaking and some more options, this app could quickly become a mainstay on a lot of people's phones. Try it. You'll like it.